I spent the night at the Hidden Lake Lookout, doing some night photography. 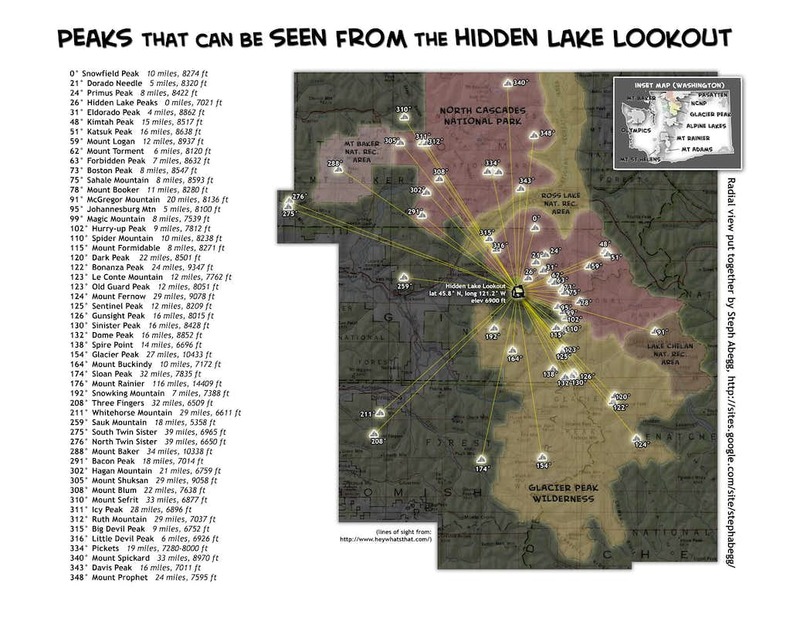 You can see lots of peaks from the Hidden Lake Lookout. I put together this line of sight diagram to help identify them. 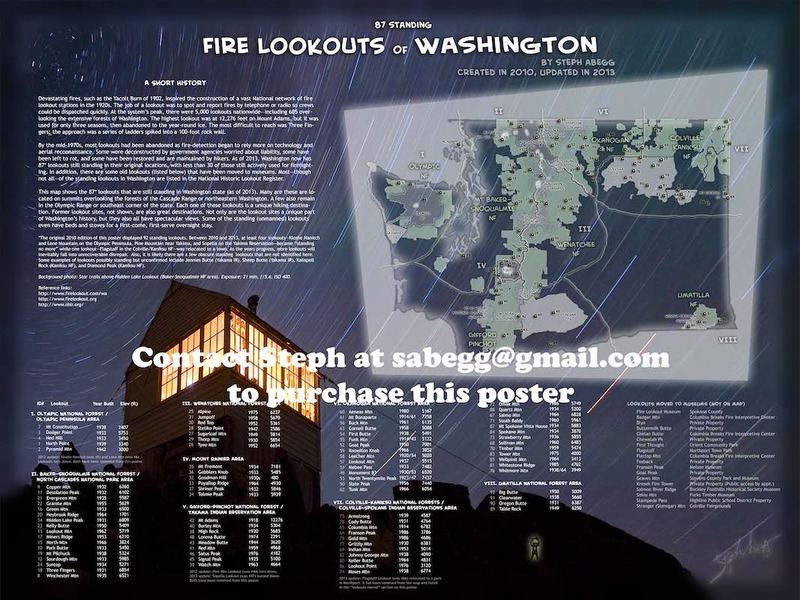 It is formatted in 8.5x11 size so you can print this radial view and bring it up to the Lookout to help identify peaks! I also went to the Lookout to do some night photography in Dec 2009. Click here to see these photos of wintertime conditions at the Lookout. The weekend of June 28-29 (2008) promised cloudless 80-degree weather in the North Cascades, so I headed up to the Hidden Lake area, planning to scramble up Hidden Lake Peak (labelled "Hidden Lake Peaks North" on maps) and stay overnight at the Hidden Lake Lookout (which is on top of "Hidden Lake Peaks South"). 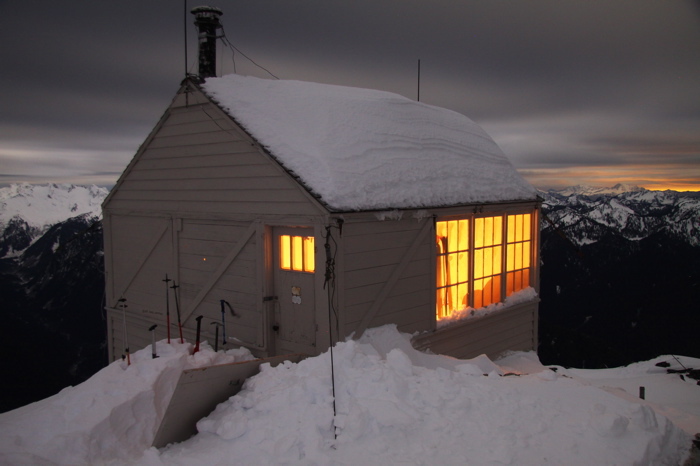 I've always wanted to stay at this Lookout, which is perched on the end of the Hidden Lake Peak ridge, with a spectacular view of the surrounding North Cascades and Puget Sound. Along with my crampons and ice axe for the early-season-high-snow-year snow cover, I threw into my pack a couple of candles, a camera remote, some extra camera batteries, and a tripod, in plans to do some night photography in and around the Lookout. Below are some photos and more detailed information from my gorgeous 2-day adventure. The 4.7-mile Sibley Creek Road up to the Hidden Lake Trailhead has been closed the last couple of years due to washouts and downed trees. This adds significantly to the mileage and elevation gain of the hike. (But I discovered that the road is drivable for the first 2.5 miles….) In a way, I am thankful for the road closure and deep snow cover this year, as it has kept the crowds away. Over the last few years, the hike had become quite crowded due to its spectacular scenery and short approach, and I never got the opportunity to stay at the Lookout which is occupied on a first come first serve basis. The sign at Hidden Lake Trailhead. From the Trailhead (el. 3,500 ft), it's about 4 miles and 3,400 ft to Hidden Lake Lookout. This isn’t much, but it usually takes a few hours as the terrain is steep and too beautiful to allow a quick pace. Hiking the Sibley Creek Road adds 4.7 miles and about 2,300 ft to each end of the adventure. I hit snow about 1 mile from the trailhead, just as the trail exits the forest. Even though I knew it was a high snow year, I was still surprised at how much snow was up there! But its mostly gentle slopes and easy route finding, so I had no trouble making my way to my destination. On my way to the Lookout, I climbed Hidden Lake Peak (7088 ft), which is just a snow slog and short scramble to the summit from the west side. I descended down the easy ridge towards the Saddle between Hidden Lake Peak and the Lookout. This photo shows Hidden Lake Peak as seen from near the Hidden Lake Lookout. The view from the top of Hidden Lake Peak is spectacular. This photo was taken looking south towards the end of the ridge where the Hidden Lake Lookout is perched. To get to the Lookout, you have to cross the snowy face and ascend the ridge on the left skyline - the snow was loose and steep, but passable with an ice axe for protection. Hidden Lake Lookout as seen from near the Saddle between Hidden Lake Peak and the Lookout. Since Hidden Lake Lookout is perched on top of a rocky peak, water would be scarce (unless I wanted to melt snow), so I scrounged up some plastic Ziplocs and filled these with snowmelt near the Saddle. Hidden Lake Lookout and its spectacular surroundings. Hidden Lake Lookout, Elevation 6900 ft. Inside Hidden Lake Lookout. This old Fire Lookout was built in the 1930s - its role in fire prevention has been phased out by aerial fire patrols, but the lookout is still in good condition and hikers can stay there on a first-come first-serve basis. There are lots of things to read and look at in the Lookout, including these rules for keeping the Lookout in serviceable condition so other hikers can enjoy it for years to come. The lookout is well-maintained by a group of volunteers called the Friends of Hidden Lake Lookout. Evening colors inside Hidden Lake Lookout. More evening colors and spectacular views from inside Hidden Lake Lookout. I can't think of a more beautiful place to spend the evening. One of the things I wanted to do while at the Lookout was some night photography. In this photo, I took a 20-minute exposure of the Lookout, situating my camera so the North Star was located in the frame and lighting a candle for 10 minutes to give the warm glow in the windows. Here is another of my photos I took at night (I didn't sleep much). In this photo, I set the camera up inside the Lookout and took a 30-minute exposure looking out the windows towards the southwest, capturing the stars streaking through the sky and the distant urban glow lighting the sky.